I just recently stumbled across the Images of War series of books. Since I am on the never ending quest for more PzKfw III information I decided I should add this one to my collection. This is the second book in the Images of War series, I ordered it from Amazon and with their amazing shipping system I managed to have it just a few days later. This is definitely a picture book and has a lot of pictures that I haven't seen before. It certainly doesn't mean they haven't been in print before, just unseen by me. It is divided up into eras rather than by type, so if you really want pictures on IIIDs and IIIEs you will need to reference Chapter 1; the Blitzkrieg 1939 - 1941. There are five chapters specifically on the III and appendix that features some of the variations. Other than the Blitzkrieg chapter everything is from the eastern front. There are no North Africa pictures in this particular book. I'll have to go through Images of War series and see if they have something specific for North Africa. Its a nice sized book, easy to handle, well laid out with no more than two pictures per page and many pages that feature just a single shot. A good general reference book for showing the III in action and various stowage and gear arrangements. A very nice addition to my PzKfw III library. 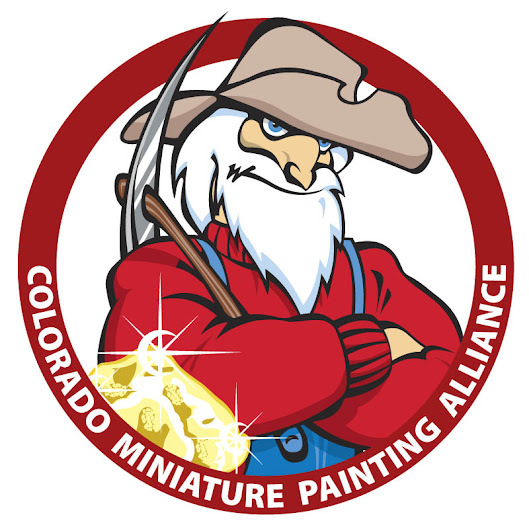 After buying figures from Pulp Miniatures to paint for the LOA Back of Beyond badge, I dug through the website a bit more to figure out what the whole pulp thing was about, because you know research. Bob recommended "The Great Pulp Heroes" by Don Hutchison and I decided that it was as good a place to start as any. My edition is newer than the one Bob shows on the website and supposedly mine fixes a lot of errors found in the earlier edition. This is truly a fascinating book. Since I didn't really know anything about this explosion of literature in American History I wouldn't have found anything wrong with it. Well written and captivating. It has certainly whetted my appetite for more pulp! I have found that most of the Shadow novels are being re-released and I'm going to have to find some of those just to sample the actual writing from this era. Likewise I hope to find some reprints of the early Phantom comic books (I don't need collectibles!). I thank Bob for his recommendation and he can probably look forward to seeing some more orders from me! I haven't done a Kickstarter providing supporting material for another Kickstarter since I backed Traveller 5th Edition. That was a mistake when I backed a Kickstarter featuring the first starship booklet designed specifically for 5th Edition. It took several years to get any rewards, although I did get the booklets eventually. I never did receive the 15mm scaled ship layouts to use with my miniatures. However, this time its a different story. 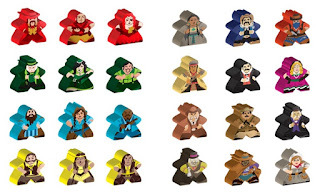 Meeple Source has a number of successful kickstarters and they teamed up with Gamelyn Games to produce a set of Meeples for the Tiny Epic Western game. There are actually two sets; the first set is to replace the player's own pieces and the second set represents the 12 Bosses (you don't actually need pieces for the bosses but it adds a lot of flavor) that eventually ended up in the Kickstarter version of TEW. I opted for both sets. This allows you to swap out the blue, yellow, green and red player pieces with full color character versions. I received these on Monday and I think they are fabulous. A great job by Meeple Source which delivered only a week or so late because of a printing error created by the printer. An excellent Kickstarter and a high quality reward. Now I really need to play TEW! In the last series of pictures there were two empty workstations. Those have now been filled by the two new machines. I'm of two minds on these. First I think they are over designed in some ways. They are built from an extruded aluminum instead of steel and feature some nice safety features that you won't find on the other machines. However, they also have a new setup for the wire trays and the electric eye and the compressed air "puffer" are now an integral part of the wire tray and while they look good and are a bit more space efficient they are much harder to adjust properly. They are producing acceptable good quality wire but we are having a hard time getting to that point and its really hard to produce the quality of wire that we strive to produce. It may be that the breaking in period is just going to take some time. All of the machines in the shop have their own quirks and we will just have to learn the quirks for these two new machines as well. Personally I wish they had just repeated the design of machines 11, 12 & 13, which are the best runners in the shop. A look at machine 14. the extruded aluminum material plus the blue safety gates in front of the electric motors (there are two electric motors one for each head, I think all the vintage WWII motors are gone now). There is a new design for the plastic that covers the heads as well. It does look good! Also not entirely happy with the new design of the feeder wheels. They are almost to heavy and are hard to adjust. Here you can see the whole machine. Note the extruded aluminum extension to support the wire receiving tray. The posts for the electric eye and the puffer are attached directly to the inner aluminum rail. We moved machine 13 into the machine 15 spot. Here you can see how we support the wire receiving tray and the electric eye and puffer on tripod stands. Adjustment is easy, you just kick it with your foot!